yesterday is a pale day and on the road i known dirty wills poisoning me. the grandma arrived ema's home just after the time i due left but i lingered the afternoon. she surely a devil, and trying united with her family, including her daughter, ema. after work time, i bought baby bread and found he playing pc game when i called him in joy. in gaming when i met English word i don't know, he unusually called his mom's help. later in dinner ema's hatred turned apparent. their reckons and trading appeared in my mind and i couldn't allow their evils upon baby nor me. the night baby tried to approached me to console me, but i don't feel happy. on bed i recognized that his mom just turned more demons into her soul and catered to baby just want to make use of it for her rest of life. the night i at first almost restlessly. 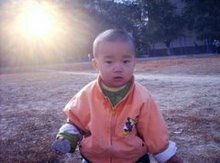 the calculation of baby's mom and her family challenged me, forced me to notice them. they r all cheap service and essentially prostitutes. they tried hard to encompass baby with what he felt satisfied and hindered him from any truth into his view, including the truth that his dad loving him and he is a man, the Son, not a demon nor a female like theirs. they tried to band and burdened baby and me with the superficial moral of family to prevent their evils judged in time, their dark and dirty cage to burned in fire of condemned on the day of cleanse. i also got in view that my mother in home town also exerted the same trick in the passed years when i too young to let me keep distance from my grand father almost all of his life, except when i was first time trapped in asylum in home town, when my grand dad got a chance to visit me in the asylum and brought a bowl of strewed yellow beans, whose tastiness i never forgot, and let me see the deep love of my grand father on me. in most of my life so far i was covered and suffocated by my mother's soft and sweat words and treats, including delicacies, to let me forgot my dad's contribution to our family. she, in family name Hu, like ema and her mother, r evils cost other's lives to meet end of theirs. they r demons, and demons that bring original sin upon us, the demon costed Jesus on the cross. after seeing that i saw God's mercy and his uncomparable glory. his eternal and untouchable. saved to see his life and re-rise, dead to in dust. after i know his glory and prayed my appeals, i got my peace and felt into sleep. baby had slept aside me awhile but left to sleep in his own little bed aside ema. i saw God in us and affirmed us in shrine. i dreamed of some interpretors in QRRS, my superficial long time employer. in the dream i likely had a partner, and we might in trouble. on the way to office, its a pale and windy morning. but i see the sunshine likely after dawn. 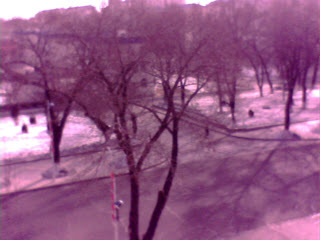 now the brilliant sunshine just too nice outside of the window. i regret not to bring my favorite new camera with me. i love these all. last afternoon it snowed shallowly, stopped after about 3 hours falling from sky. its likely the only and last snow in spring of lunar 2009. God, i u see my need. i want to bring my camera everywhere, and seeing ur world every moment in still or moving.